Set in the lowlands of Scotland during the First World War, this story mixes graphic and moving descriptions of wounded soldiers returning home often to die with a plot-line so unbelievable that even Enid Blyton might have thought twice before going with it. 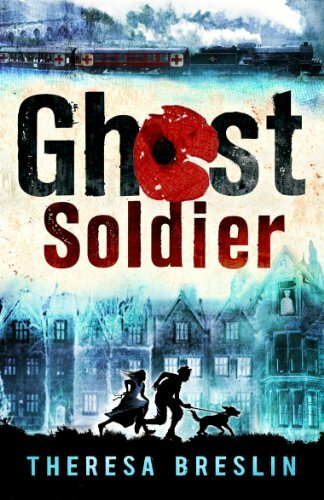 Main characters twelve-year-old Rob and his younger sister Millie, aged seven, are determined to find out whether their father reported as missing in action may still be alive. To that end they keep a sharp eye on a hospital train running through nearby, and via several very fortuitous over-hearings eventually track their parent down. Other sub-plots involve a Belgian doctor thought to be a German spy and a local lad on sick leave driven mad by his experiences on the front. Rob and Millie manage to sort him out too, each talking and acting far more like responsible adults than the children they are supposed to be. There are memorable descriptions of life on the home front and the grief suffered by those finding out that their loved ones have been killed. But they are yoked here to a distinctly creaky overall story.